Some ASUS computers include a promotion for extra Dropbox space. This promotion is generally available on new ASUS computers purchased in select countries in May 2015 or later. If you don't see the Dropbox icon pre-loaded on your computer's desktop or Giftbox, then you're not eligible for this promotion. Read on to see additional terms and eligibility rules. For how long is the promotional space valid? How can I check if my device is eligible? If I purchased multiple promotion-eligible devices, can I redeem the same offer multiple times? No. Each Dropbox account can only redeem the ASUS device promotion once. Can I transfer my promotional space to another Dropbox account? No. The promotional space is not transferable once it has been redeemed. Can I get the promotion on a refurbished or used device? No. The promotional space is only available to the original buyer of a new, eligible device. For devices where Dropbox is pre-loaded, the Dropbox installer icon appears on the desktop of a computer when it’s first turned on. In this case, double-click this icon and follow the instructions to install and create a Dropbox account. Then complete at least five of the seven steps in our Get started guide. 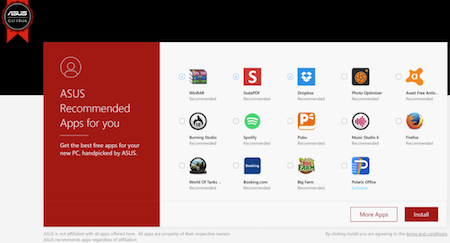 When you turn on your ASUS machine for the first time, the Recommended Apps widget shows a selection of apps to install. Dropbox should already be checked. Click the Install button, then follow the instructions to finish the install and create a Dropbox account. Your ASUS device should come with the ASUS Giftbox, and Dropbox listed in the Exclusives section. This is true provided you don't already have Dropbox installed on your ASUS machine. To install Dropbox, click the Install button, then follow the instructions and create a Dropbox account. I'm unable to redeem the promotional space on an eligible device. Can you help? Did you link your ASUS computer to an existing Dropbox account? Did you complete at least five steps of our Get started guide? Did you sign in to Dropbox with another Dropbox account? You can only redeem the promotion with the Dropbox account created on the eligible device. You must also sign in to Dropbox with this new account on that device. The promotion may not be transferred between accounts. You can't redeem the promotion if you lost access the first email address used to create your Dropbox account. Have you redeemed another ASUS promotion? Was your device refurbished or pre-owned? Did you install Dropbox with the installer shortcut on your desktop, or via the Dropbox link in the ASUS Giftbox? How do I check if I've successfully redeemed the promotion? Under Earn more space, look for a Asus promotion. Under Earn more space, you can see the Asus promotion and the expiration date. What happens when my promotional space expires? When your promotional deal expires, your Dropbox space limit will automatically return to what it was without the promotional space. For example, after this promotion a Basic account returns to 2 GB (plus any space earned through referrals or other bonuses). If you're over your limit after expiration, you'll no longer be able to save new files to Dropbox. You can get more space by upgrading to Dropbox Plus. Am I eligible for the A1 + Dropbox space promotion? How do I redeem the Dropbox promotion that comes with my device? Is my Acer device eligible for the Dropbox space promotion?